Located in Fountain Square, Woodcutter's Bar and Grill is a stylish eatery, offering a wide variety of food straight from the grill, as well as being one of the few places on park which serves alcohol. Woodcutter's is is one of the parks more premium restaurants and located in Fountain Square, between The Towers and Dark Forest. The restaurant often stays open late, meaning guests can relax with a meal or a drink and avoid the car park queues. 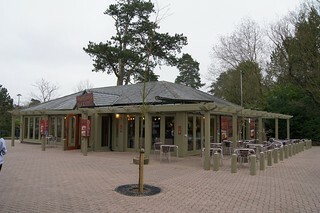 Woodcutter's Bar and Grill opened in 2010 with the launch of the Dark Forest. Before this it was known as Ritas Chicken and Ribs.